I get to share a totally purrfect nail polish with you today. I'm letting the cat out of the bag on Different Dimension Soft Kitty, Warm Kitty. So, let's see what the cat drug in, shall we? I used two coats of Soft Kitty, Warm Kitty over China Glaze Pelican Grey. Pelican Grey is just a whisker darker than the grey base of Soft Kitty, Warm Kitty. They work very well together. This polish has a soft, silvery-gray jelly base filled with bunches of charcoal, white, and holographic silver hex glitters. 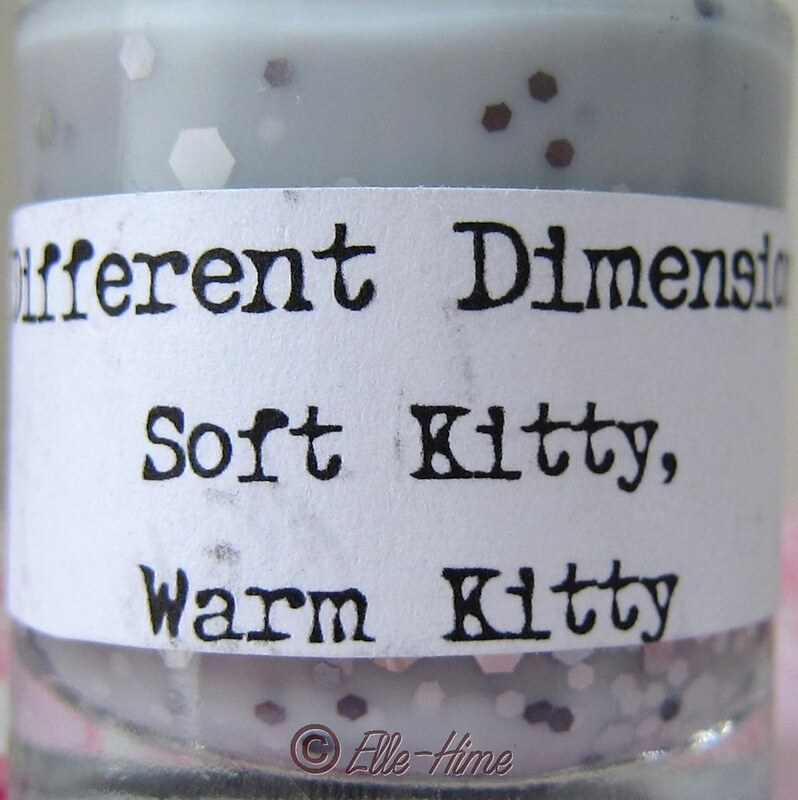 Out of all the Different Dimension polishes I have this one had the most glitter plastering the sides of the bottle. It took lots of rolling and shaking to get the glitters loose and in reach of the brush, and it improved as I used it. No bubbling at all in the polish even with my shake, apply, roll, shake, apply method! The large size glitter did take some dabbing placement and careful application so it would not be drug to the tips, but it was nothing like herding cats. I've dealt with worse! This polish is totally worth it, too. Except for two conjoined glitters (Siamese twins??) on my pinky finger, the pieces laid flat and the polish had an irresistibly shiny finish. 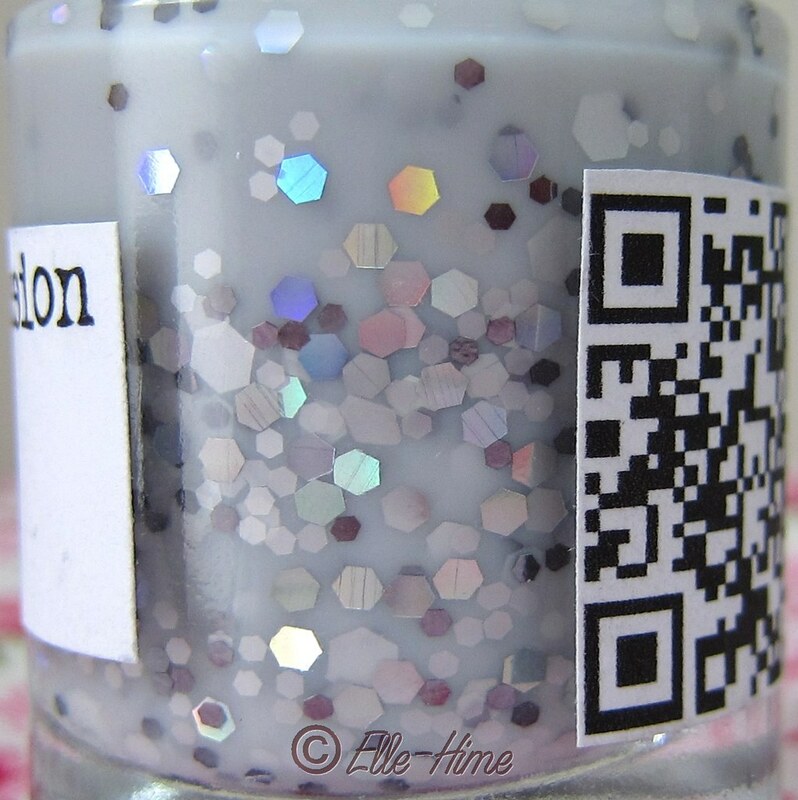 The silver holographic glitter is a perfect touch, as it will occasionally flash brightly in the subdued polish. Even my husband thought it was very pretty for a grey, which he imagined was hard to make eye-catching. I'd call it the cat's meow, especially for our upcoming grey days when it's raining cats and dogs. Of course, I'm partial to this sort of grey, too. It's pale and non-dreary, definitely reminiscent of grey puff-ball kittens and my favorite of the big cats: snow leopards! So of course I love this. For a polish named after a ridiculous nursery rhyme it sure is the cat's pajamas! Don't pussyfoot around, go get your paws on a bottle at the Different Dimension etsy store! Also, leave me a comment on your thoughts, unless the cat got your tongue. Sorry for all my catchphrases, I was only kitten around. No hard felines? I love this polish!! AMAZING! Hello there! What is yous point of view on commercial pop-ups of any kinds on blogging websites? Different Dimension - That Is So Fetch!